The fish are here and more are on the way. A trip nearshore this week resulted in massive size Spanish Mackerel and Blues. 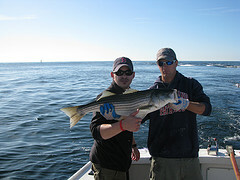 We caught Bonitas as well. Mahi are making their way in..some as close as 20 miles. Grouper are around the 30 mile mark. 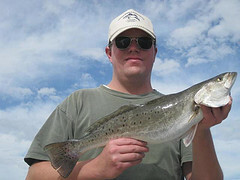 And for those who love inshore fishing, we are seeing more flounder, drum, and trout. Would love to take you out for a day of fun! Everything starts to come together offshore at this time of year, and this is the month where the most radical change in fishing occurs. 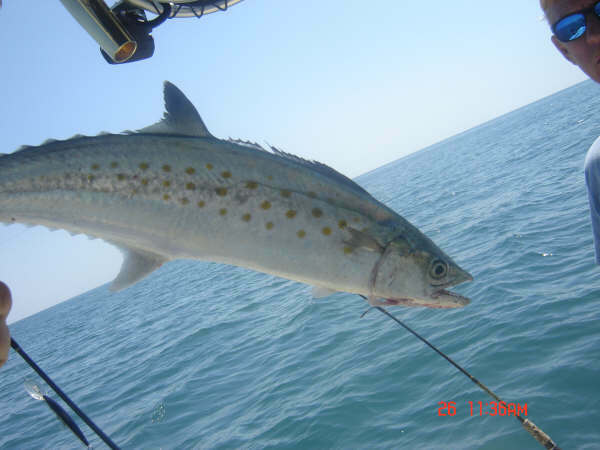 The King Mackerel have moved inshore, and can be found from 10 to 60 miles offshore. The cobia have started to make some appearances, but really show themselves at the middle to end of this month. 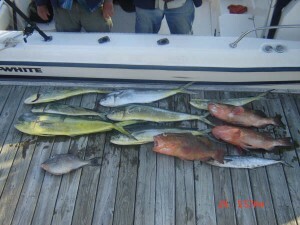 Dolphin have shown up in the Gulf stream well, and a nice mix of gaffers and bailers are there to be had. A few have already moved into the 30-35 miles range. Grouper are biting form 40-60 miles right now, but will keep moving in. Wahoo are providing a good bite right now, early in the morning or late in the afternoon though. The billfish start to show up this month, but are primarily offshore until the Sailfish come in during June. Amberjacks are always there to provide a fight like no other, and can also give a great meal if you take the loins off of the top. There is plenty of fish to be had off of the beach right now and it will stay like this for the rest of the summer and fall. The grouper fishing off our coast is good as usual right now, with Gags and Reds biting biting from 15- 35 miles right now. 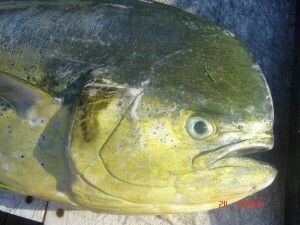 They will be willing to bite most live baits as well as cut bait and cigar minnows droppeed on any ledge. 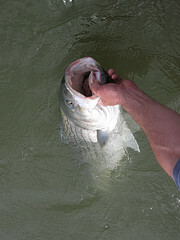 There are also many different assorted bottom fish willing to tug your line right now. The snapper and sea bass provide a great fight and a fantastic meal for anyone, and they are also easily caught by all ages. The fishing will continue to be heating up as the spring season comes upon us, and will bring in the many different migrating species of fish into the warming waters of the Atlantic.